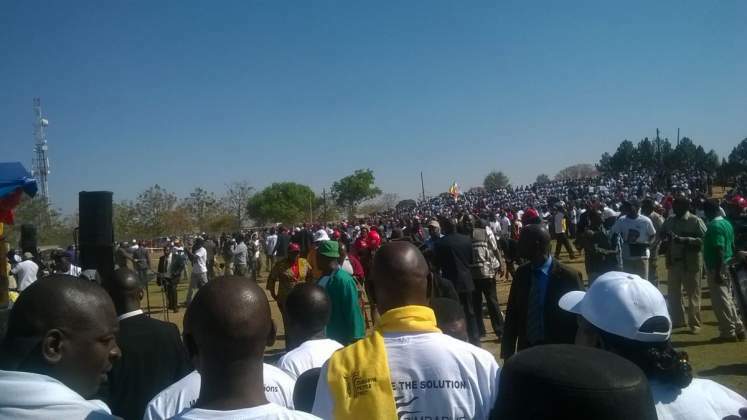 President Mugabe this afternoon addresses the seventh Youth Interface rally at Mkoba Teacher's College Open grounds in Gweru where more than 120 000 people from all corners of the Midlands province are expected to converge. We give you live updates of this event. Stay logged in and join the discussion forum below to share your ideas on the issues being raised in the key address. This brings to an end the proceedings here at Mkoba. Thank you for joining us. feel free to express your views in the conversation below. 15:43 - The youth league has given the first family a gift as Jason Machaya is now gives vote of thanks. 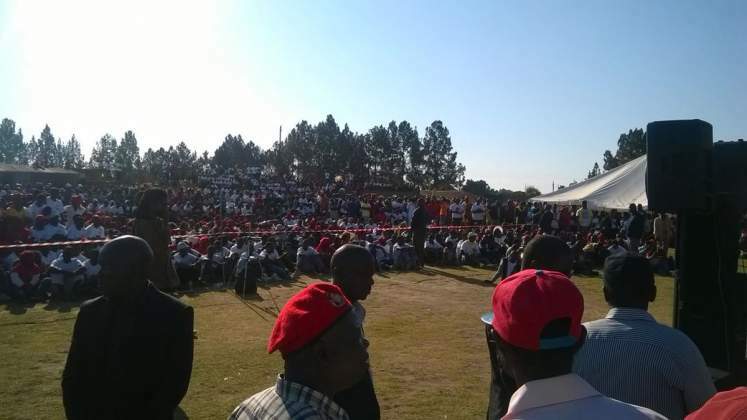 He thanks President Mugabe for blessing the province and factionalism is now a folktale. "So we are together again, let's be together, no insults . . . I want to thank you as a province for coming together. Don't get disunited. As I say all the time in remembrance of John Nkomo "peace begins with you, peace begins with all of us," says President Mugabe as he ends his address. 15:32 - He says, "mukandibikira sadza ne broccoli ndoti ndaguta . . . hanzi ndoyava kufanirwa kudya mavegetables kunyanya broccoli iyoyo . . . nyama akanzi rega kubata, yemombe, yose nyama chero hove, hameno zvako, mudzimai wako ndiye achaona . . .akanzi (He has been advised to take sadza and broccoli, he has not been advised to take meat, including fish) he is now strong and back to normal," he says to a bout of laughter from the gathering. 15:22 - He says Vice President Mnangagwa's doctor came to explain what happened with the VP and they spoke for an hour. He says the doctor says there were no traits of poison in the Vice President's blood. 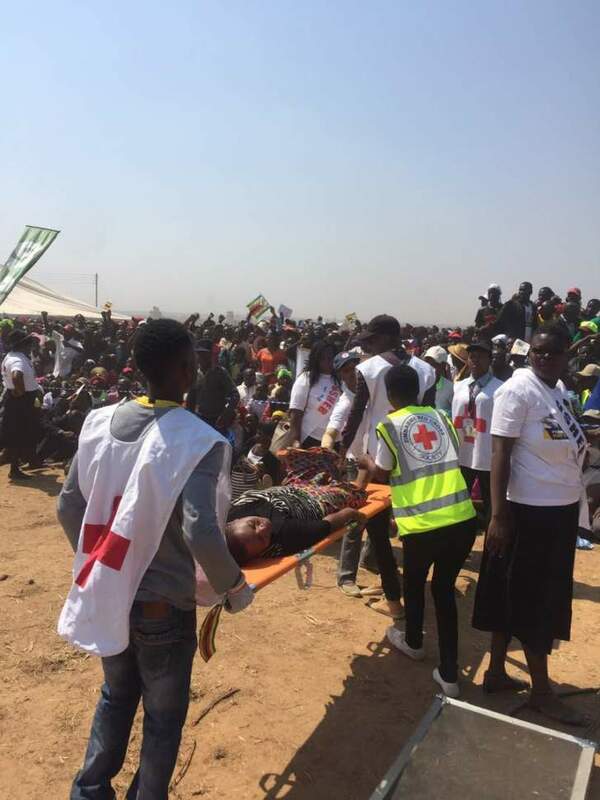 But what amazed us was how Mnangagwa vomited and had diarrhea and there was swelling and they fought a battle to save him. They gave him about four drips in succession... "Anga akuenda murume uyu" (He was almost dying this man). 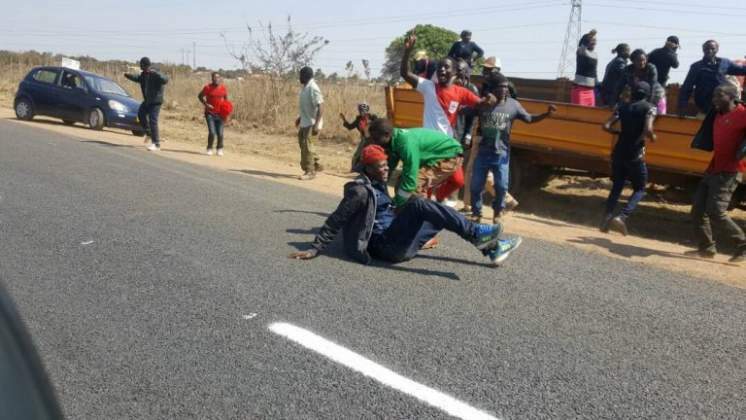 He says Sekeremayi and Parirenyatwa have been falsely accused as having poisoned vice President Mnangagwa but blubbering mouths are a sin when they accuse others of witchcraft. 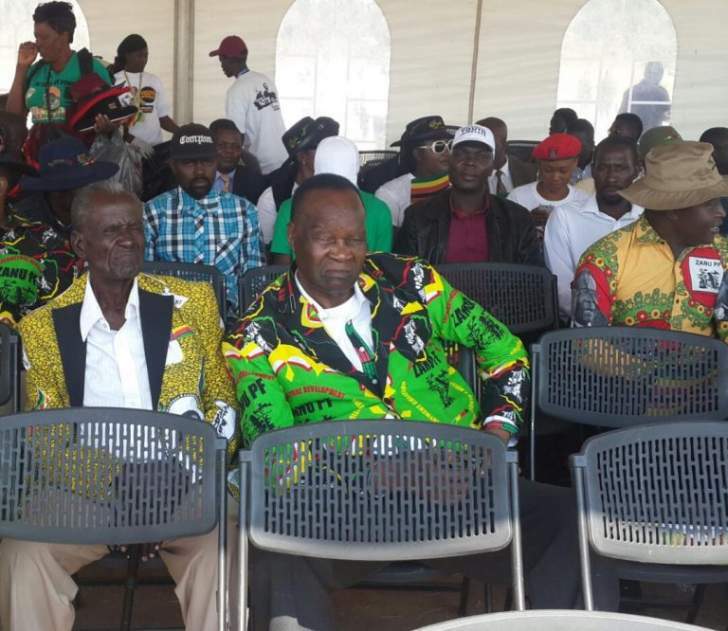 Defence Minister Dr Sydney Sekeramayi with Vice President Emmerson Mnangagwa attending the Manicaland Presidential Youth Interface Rally. - File Picture by Hatred Zenenga. 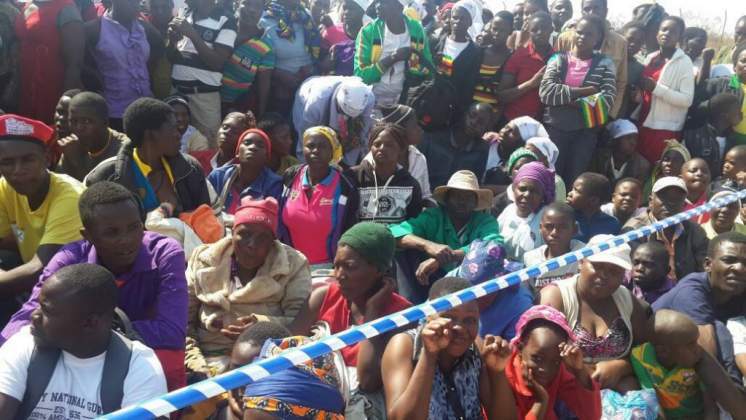 15:20 -"Kana tonzwa kuti kuri kubuda shoko rekuti ah kune varoyi vamwe vakadya ice cream, VaMnangagwa vozoti handina kumbodya ice cream . . .(Then we hear there are witches, and that others were poisoned through ice-crea, then Mnangagwa says he never ate ice-cream . . .
" As for us we asked our parents about our history and they told us of the likes of Nehanda and Kaguvi and what they stood for . . .
15:09 - "We need you, the youths, to have a sound ideology of the party. Youths should have knowledge of the history of the party, why we were put in detention, why we were put in keeps? . . .
15:05- He says numbers of those without land should be handed over to Government and they can have access to farming land. 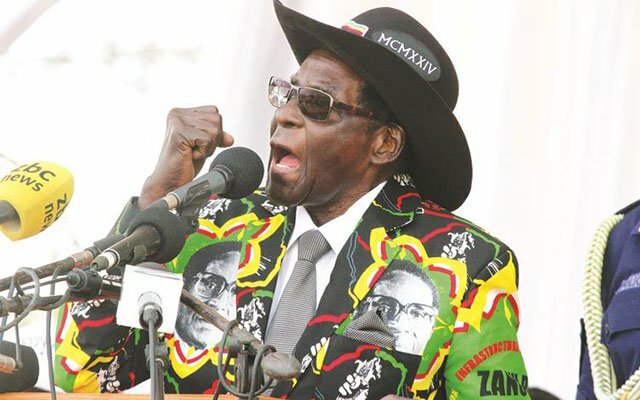 President Mugabe narrates how Rhodes colonised the country . . .
14:59 - When I asked someone in Zuma's (SA President Jacob Zuma) administration why the whites still have so much power . . he said "I ask your friend Mandela" as if Mandela was still alive . . . apparently Mandela negotiated with the whites by himself. Chaive chikuru kwaari yaive freedom yekubuda mujeri achikanganwa kuti zvikuru ndeizvo zvaakaendeserwa kujeri (Apparently Mandela viewed his release from jail as more important but forgetting about how he had been jailed in the first place). 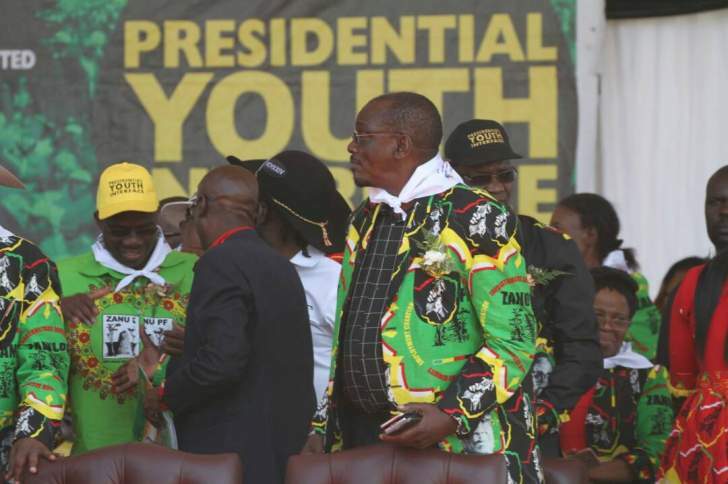 President Mugabe says in Zanu-PF there's no dictatorship . . ."As a leader, you must be able to listen to what others say⁠⁠⁠ . 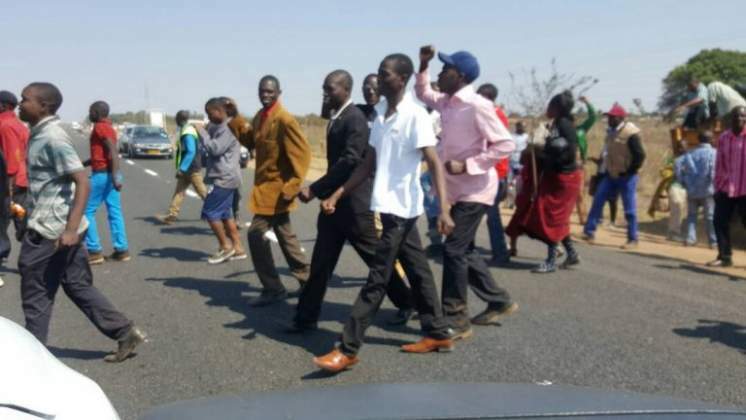 . .
"Musangano hausi wa leader, aiwa, musangano ndewe vanhu. The leader mutungamiri we musangano. 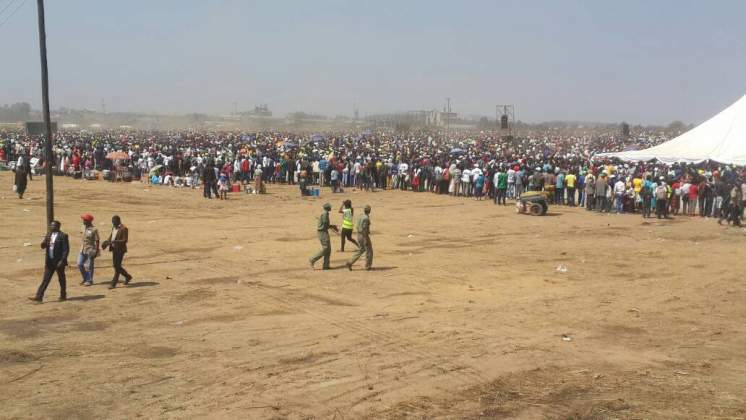 14:53 - He says some people sold out when was in jail during the liberation struggle . . . He narrates the events that happened at the Lancaster House negotiations. 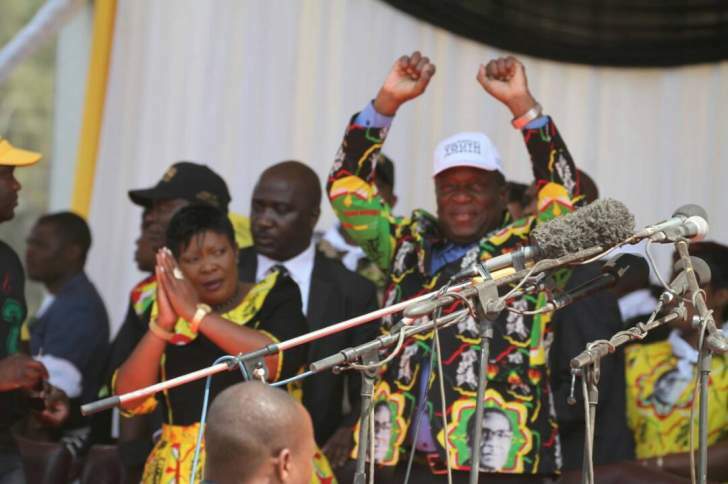 14:44 - President Mugabe says there is no such thing as witches and wizards in the party . . .
WITCHCRAFT IN THE PARTY? NO. 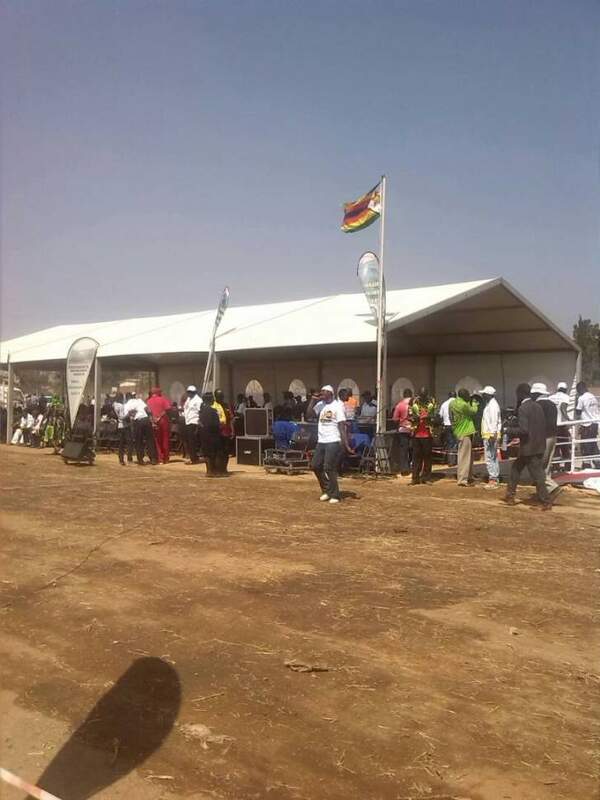 14:34 - President Mugabe is now preparing to take to the podium and Jah Prayzah's "Mdara Achauya" is playing. 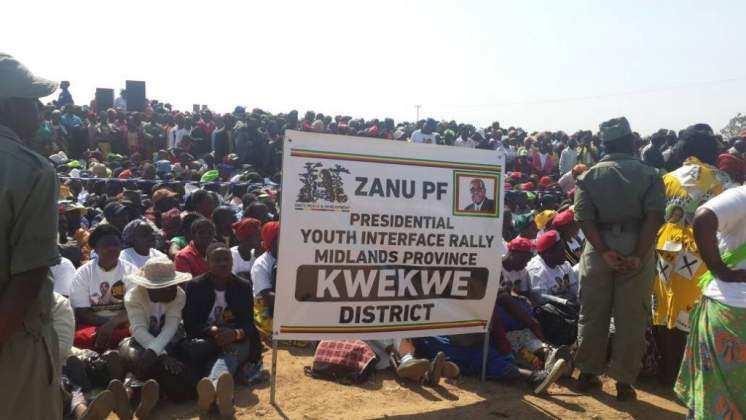 14:25 - "You must be loved by all provinces not just one if you want to lead Zimbabwe . 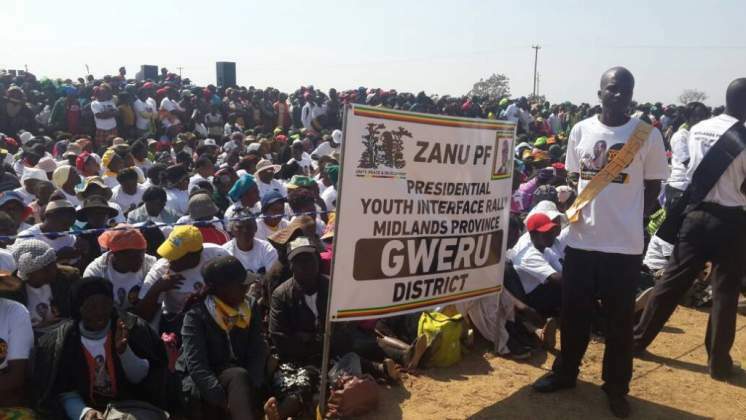 . .
An estimated 120 000 Zanu-Pf supporters attend the Midlands Province Presidential Youth Interface Rally at Mkoba Teachers open ground in Gweru, September 1, 2017. 14:24 - "That is why we respect you as the President because you tolerate everyone . . . God still wants President Mugabe to lead and he will tell us when he wants to step down. 14:22- "If you see bad things happening to you don't then turn around and say President Mugabe has bewitched me. President Mugabe thought all he wanted to do was to be a teacher but God had a bigger job for him. 14:19 - "Listen to me because I am your mother . . . those who scold President Mugabe and his family will not be blessed"14:20 - "VaMugabe vakaziva Mwari vasati vambove muchibereko cha Amai vavo . . . read Jeremiah 1 verse 5. Kutaura kwakashata hakuvake musha (Quarreling is not good for family unity),"
14:18 - "Those fanning factionalism should STOP IT!" 14:16 - "We want unity....Midlands I hope you are not involved in factionalism like you have said today but what we hear is a different story . . . unless you' are saying from this day forth we are united then I may be convinced," says Dr Mugabe. 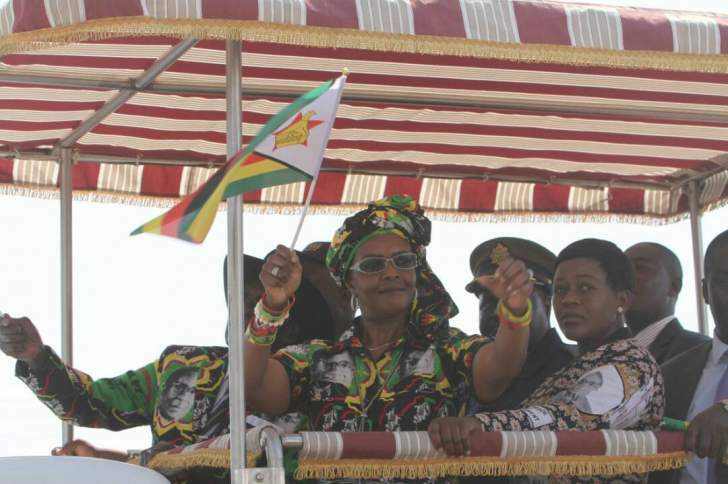 "I once said what we do in the President's presence should be the same with what we do in his absence"
14:13 - Amai Mugabe says she is originally from Midlands and is a Karanga. 14:06 - "We don't want the name of our war veterans to be tarnished by a few individuals who dream that they will one day rule this country,"
"We don't tolerate factionalism..usave nekamwe ka president kunze kwa Mai na baba Mugabe"
14:02 - He says every edition will carry the images of the President and First Lady on its cover page. 13:59 - The Youth League has started publishing the Interface magazine that will soon be sold locally. He says the magazine will capture all the activities being done by the youths and women's league. He urges the youths to register so they can vote in 2018. The youth leader says the new recommendation to change over from metal IDs to plastic ones should be looked at closely. 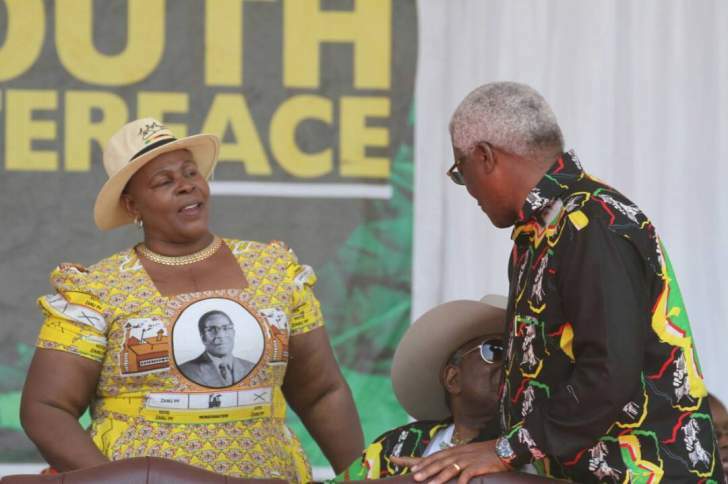 13:54 - Chipanga endorses President Mugabe as the sole 2018 presidential election candidate for Zanu-PF. 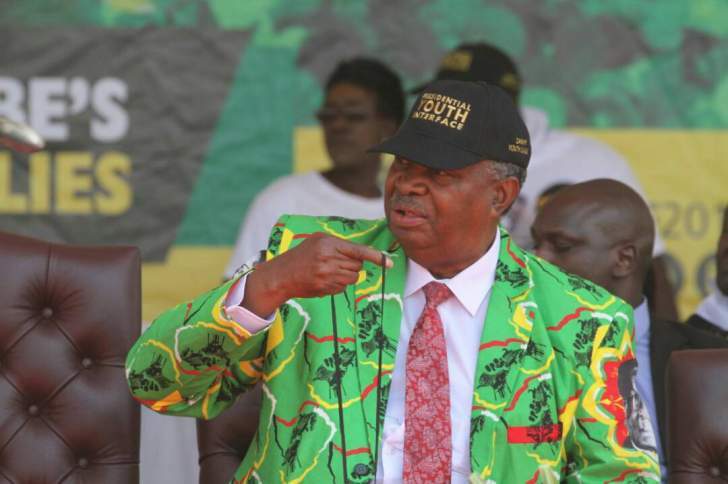 13:41 - He says Midlands is not a factional province but a province that follows President Mugabe and Grace Mugabe. He calls for full youth participation in all government initiatives especially in farming programme of Command Agriculture. "Youths got offer letters but the same youths saw those offers being withdrawn," says Machando. "We got chrome claims but Zimasco got claims that are under other people's names. The same is the case regarding residential stands . . .
13:39 - Machando says youths need loans to start businesses because after school they can't find jobs. He says college students who fail to pay fees should be allowed to write exams and look for the money afterwards. 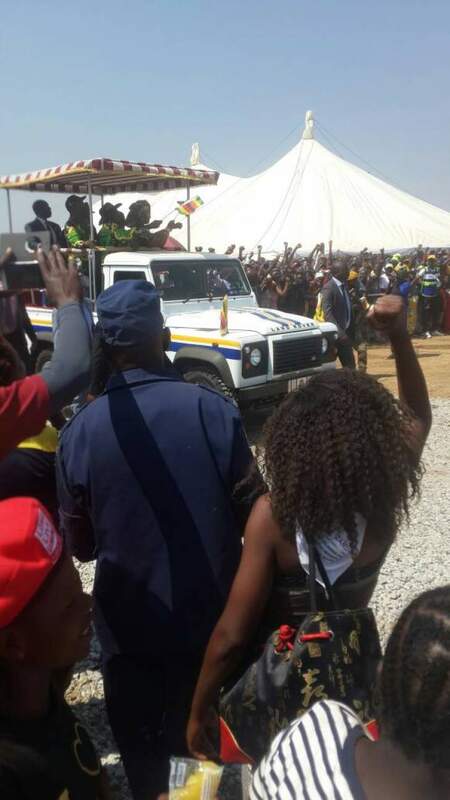 13: 28 -VP Mphoko is now greeting the party supporters followed by VP Mnangagwa. 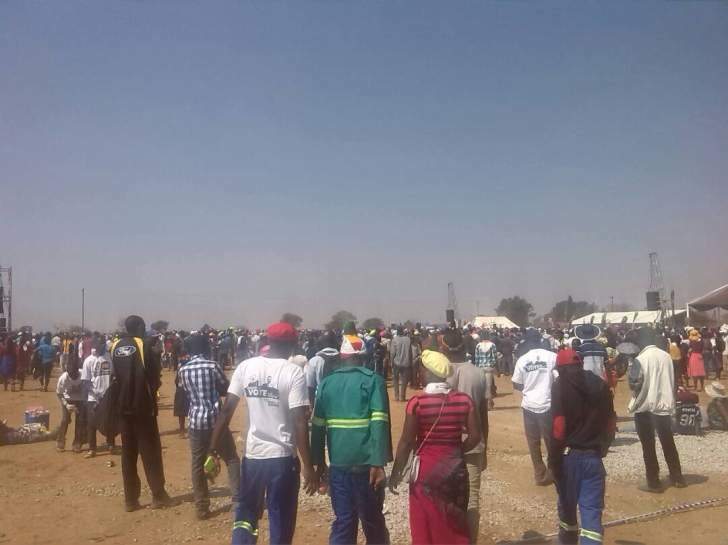 13:24- Hamandishe calls on Chipanga to introduce Politburo members as the Youth Secretary advances to the podium chanting the slogan. He begins to introduce the Politburo as well the Central Committee members. 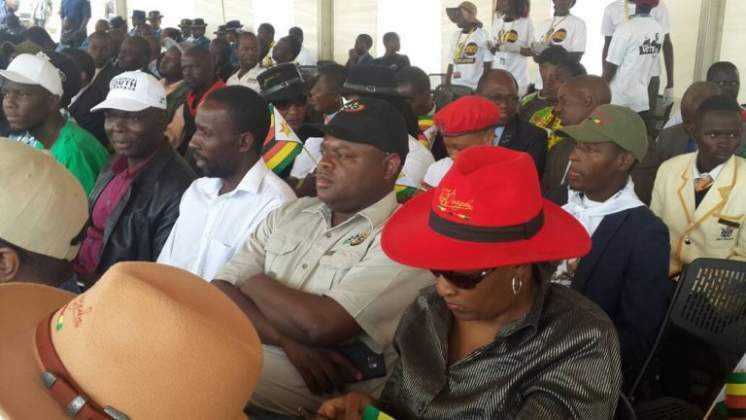 Vice President Mnangagwa and wife, Auxillia Mnangagwa are in attendance. 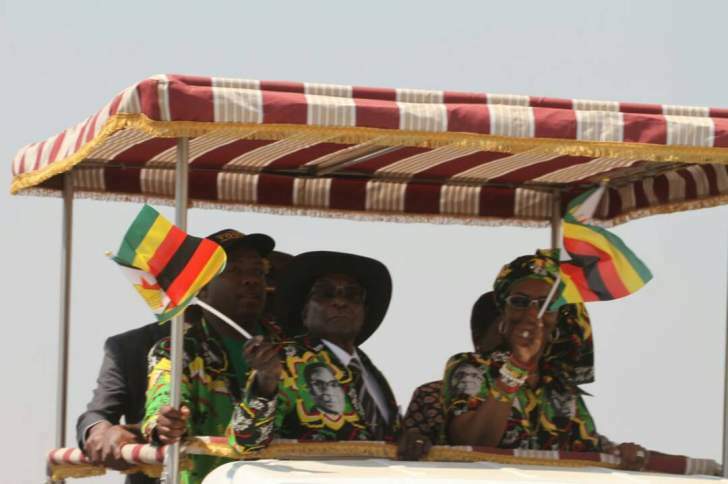 13:05 - President Mugabe and First Lady Grace Mugabe are now making their way to the main stage. Whistles and ululating fill the air. 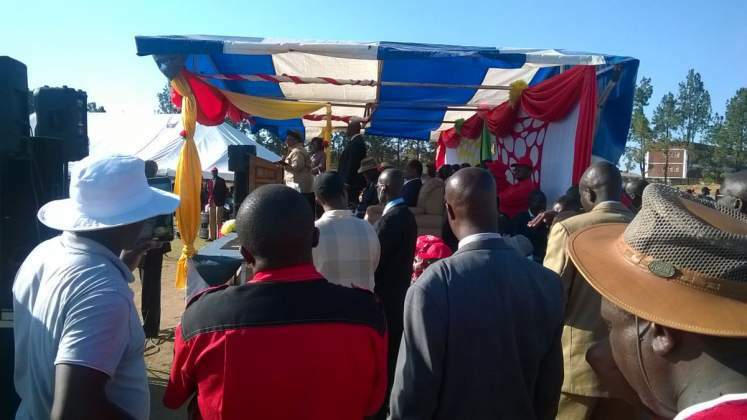 Mnangagwa's Midlands Province also donated to the First Family three Tuli pure breed beasts, a bull and two heifers. 12:36 - National Political Commissar Saviour Kasukuwere has arrived , followed by Vice Presidents Phelekezela Report Mphoko and Emmerson Dambudzo Mnangagwa. More than 120 000 are expected at Mkoba Teachers College open grounds this afternoon as more continue to flow in. 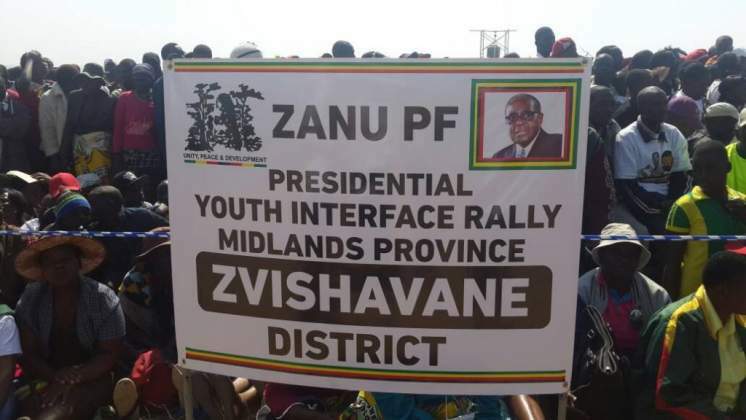 Zanu-PF has 536 party districts in the eight administrative districts in Midlands and today's rally is the seventh one with President Mugabe having visited Mashonaland East, Manicaland, Masvingo, Matabeleland North, Mashonaland West and Matabeleland South provinces. 12:27 - Meanwhile State Security Minister Kembo Mohadi has just arrived. 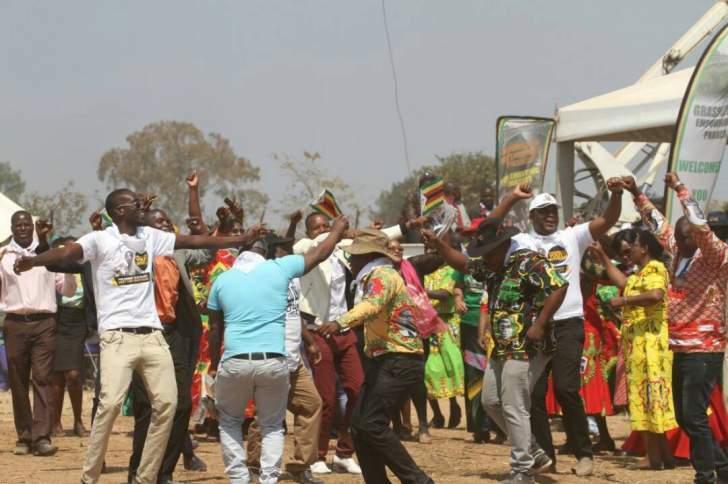 The National Railways of Zimbabwe (NRZ) pledged wagons for support in areas such as Mberengwa, Zvishavane, Mvuma, Lalapanzi and Kwekwe for the Midlands Province Presidential Youth Interface rally. 12:07 - Speaker of the National Assembly Advocate Jacob Mudenda has arrived at the main venue. 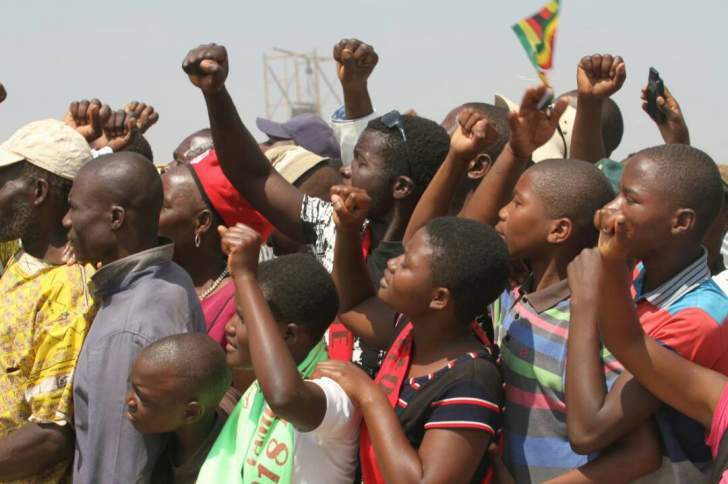 11:59 - Mbare Chimurenga Choir is currently keeping the bumper crowd on their feet with their discography of music. 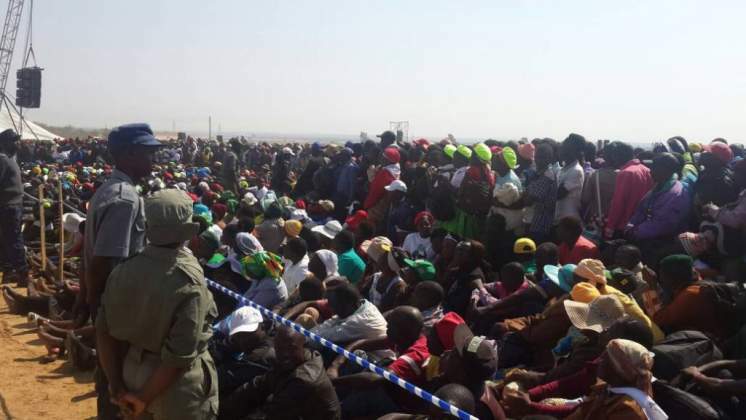 Meanwhile at the main venue in Mkoba, the numbers keep swelling with the party faithfuls still trooping in. 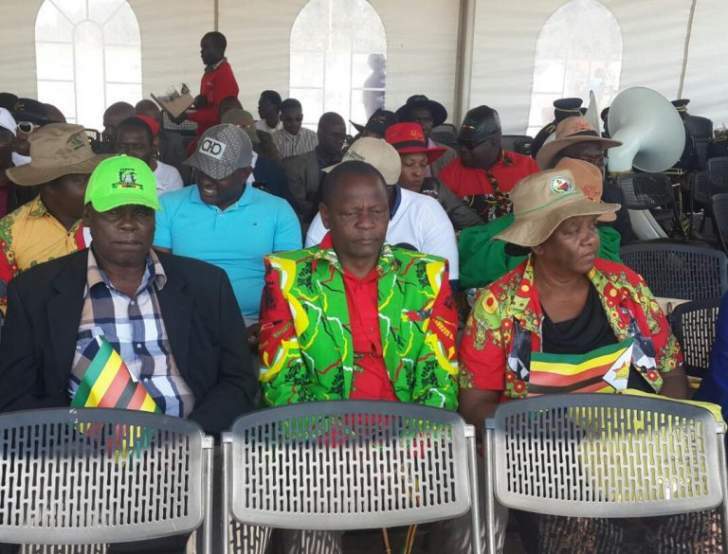 Professor Jonathan Moyo is also attending the Midlands Presidential Youth Interface Rally at Mkoba Teachers College. 11: 31 - President Mugabe has just arrived at the Information Center and is welcomed by Minister Mandiwanzira. 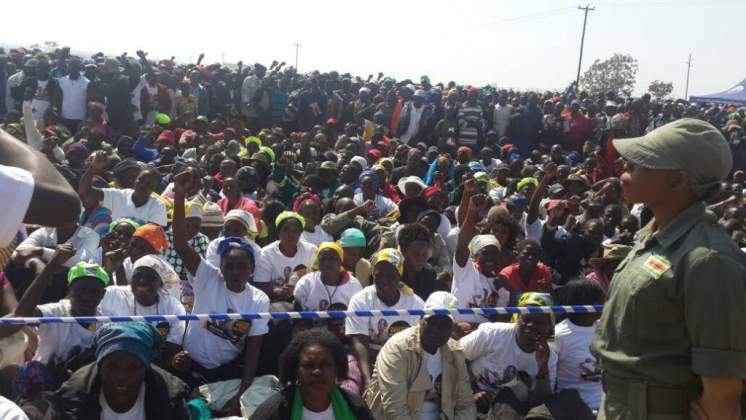 11:00 - The Zanu-PF First Secretary, President Mugabe has used the rallies as an opportunity to impart in the youths the need to protect the revolutionary legacy that brought independence to the country. 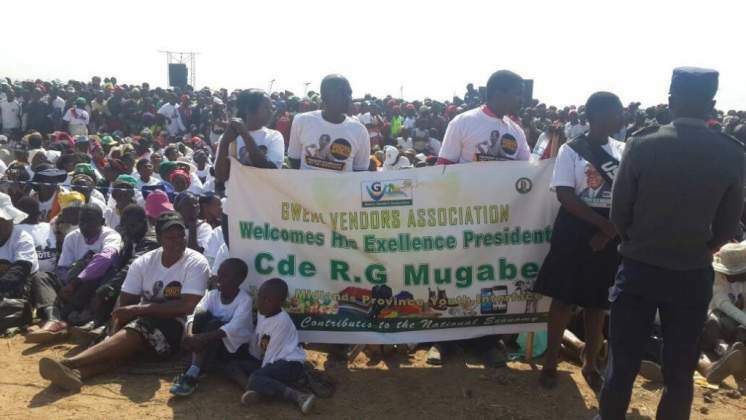 President Mugabe is also scheduled to commission the Gweru Community Information Center before proceeding to the main event.